Better than 90% of our competitors do not. Those that do build their own DVR's typically do so out of state – at the corporate headquarters. If this is the case, the technical know-how that comes as a natural part of that process remains at corporate and is not translated to the field. Suffice to say, most of our competition DOES NOT build their own DVR's – they outsource them. necessary hardware to support your change in direction. our on-site service time – the software is FREE! DVR capacity was maxed out. Security supplier in our market. 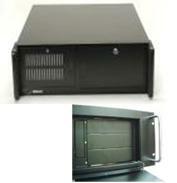 the link to our eBrochure "Mega-Pixel IP Cameras Insert"
“loaner” DVR. NONE of our competitors offers this service. video storage capacity specifications of our systems vs.
from most of our competitors. FOREVER MONTHY PAYMENT to a 3rd party monitoring service. our Tech Note, "Self Monitored vs. 3rd Party Services". fire-prevention sprinkler systems or access control systems. Scale Systems - CLICK HERE. replacement – saving you cost as well as aggravation.